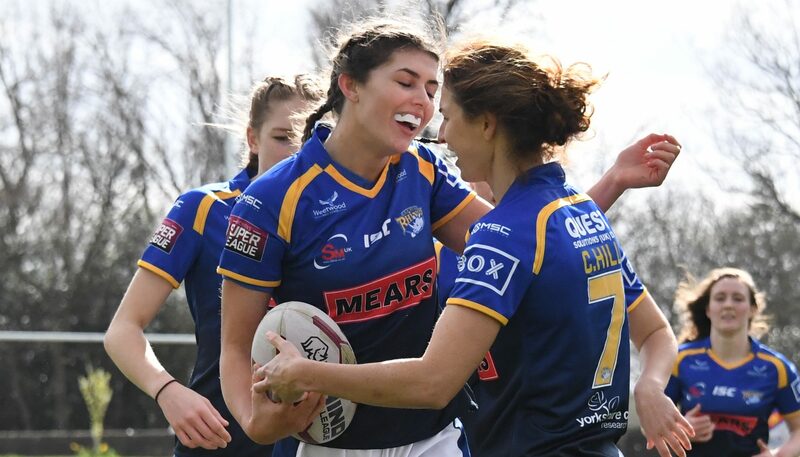 An Elle Frain hat-trick helped Leeds Rhinos Women to a hard earned victory over a tenacious Featherstone side at the LD Nutrition Stadium. 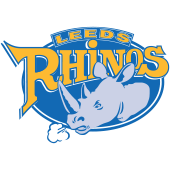 The bitter and blustery conditions would make ball handling a challenge for both sides; the Rhinos kicking into the swirling wind in the first half. The first error of the game would come inside Leeds opening set but soon Featherstone returned the favour just metres from the Leeds line. The Rhinos would soon be back in the Rovers’ half in search of the game’s first points, Courtney Hill grubbering into the Featherstone in goal area looking for a chaser, the kick guided dead by the opposition full back. Hanna Butcher picked up where she left off last week, backing herself through created gaps, getting to within 10 metres of the Rovers’ line before being cruelly denied so close to the line. A penalty then set Leeds up in good position but a handling error would cost them. Featherstone had come with a clear strategy, quick play up the middle and work the play the ball area in search of gaps, the bold strategy coming up good for the Rovers as they won back to back penalties to put them on the Rhinos line, Leeds’ defence holding firm and denying the home side first points. Rovers ability to convert possession into points would be questioned once more as the most clear-cut chance of the game would see the ball go to the deck with the try line begging. Leeds were less forgiving with their chances as they were awarded a penalty on the 5th tackle, deep in Featherstone territory, Danielle Anderson skittling the defence with a powerful run putting Leeds within five metres of the line. Tash Gaines diving over for the game’s opening try. Courtney Hill unable to convert from out on the left. Featherstone found a response on the 24th minute, more strong up the middle play close to the Leeds’ line leaving Katie Hepworth spinning out of contact and wrestling to get the ball down under the sticks. Hepworth converting her own try to push Featherstone out to a 6-4 lead. Leeds’ right edge snapped into action, moving at speed and stretching the Rovers’ left edge, Butcher crabbing at the line before releasing Sophie Robinson who would swiftly catch and pass to put Elle Frain over in the corner, Courtney Hill’s kick caught by the wind and pushed by the post. Leeds had clearly found a favourable side to attack down as the right side would once more come up with the points, Hanna Butcher once more carrying the ball into the line, offloading above her head and putting Sophie Robinson in position with a two on one attack, Robinson putting Elle Frain in the right corner to extend the Rhinos lead, the kick from the right unable to be converted as Leeds took a six point lead into the half. Featherstone would start the second half in high spirits and with tough attack, however, they would struggle to find their way over the line, big opportunities blown at the start of the half again. Leeds’ bench was quickly deteriorating, Beevers forced off in the first half with a leg injury and Sophie Robinson now pulling up out of contact to give the Rhinos great cause for concern, Robinson able to leave the pitch on her feet thankfully, but playing no further part in the game. Elle Frain’s afternoon would just keep getting better and better, the young winger finding her way into the right corner for a third time, Butcher yet again creating space with her quick feet, finding Booth who would link up with Frain. Courtney Hill unable to convert with the wind not letting up. Leeds had found their attacking stride in the second half. Aimee Staveley running over defenders to within 15 metres of the Rovers line, a quick play the ball releasing Hanna Butcher, offloading for Danielle Anderson to put the Rhinos number 10 over, Courtney Hill converting to push the Rhinos out to a 20-6 lead. A moment of controversy would bring Rovers’ next points. A skewed kick bobbled and finding its way into the arms of Hanna Butcher, Butcher racing 80 metres to score only for the try to be chalked off for offside, Featherstone then going down the other end to score through a surging Andrea Dobson, Hepworth converting from straight in front and the score shifted to 20-12 in the Rhinos favour. 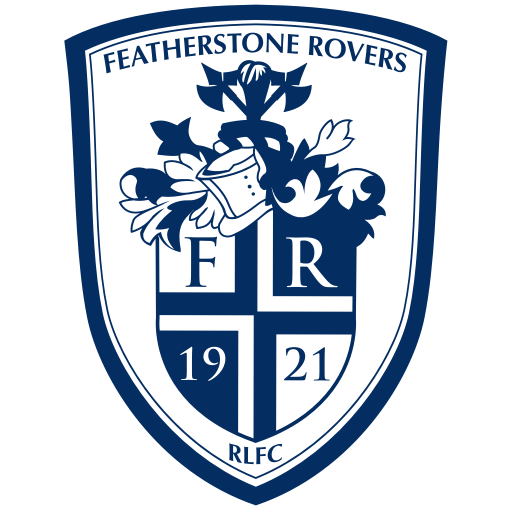 The game would be pushed to the wire when Rovers crossed in the corner with eight minutes to play, Featherstone shipping the ball to their right edge and Brogan Kennedy sliding over for the home side. Hepworth unable to convert. Hanna Butcher capped off a stellar performance with a try of her own, Gaines’ fast thinking around the play the ball would find Butcher and send her crashing over for a try and a Leeds victory at a score of 24-16.